Although there are hundreds of potential applications for the Data Egg (see the bottom half of this page for a brief list of ideas), research indicates that the largest single potential demographic are teenagers and college students living in the U.K. Why? Because although all of them have cell phones, none of them talk on their cell phones - instead, they send short alphanumeric text messages to their friends using the cell phone's numeric keypad! And these text messages (known in the industry as SMS - Short Message System) are extremely popular throughout Europe and Japan - more than a BILLION messages per month are being sent; with 5 billion per month projected by 2003. Informal market research indicates this demographic will be attracted to the Data Egg platform because A) It is COOL, B) It will be able to play games, and C) it makes it possible to rapidly type SMS messages during everyday activities like no other typing scheme on earth. The SMS market in the European Union reached one billion short messages per month in April 1999. The market size thereby doubled in about six months. This market is expected to increase to a total of 2.5 Billion by the end of 2002, and 5 Billion messages per month by the year 2003. Source: Mobile Lifestreams, April, 2001. Presented here is a gallery of modern applications which are simply crying for a Data Egg interface. The ironic thing is, if you polled any regular users of these products and ask them for feedback, none of them would identify the cumbersome text entry scheme as being a problem. 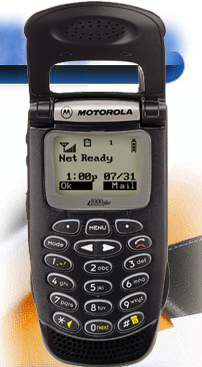 The PageWriter (tm) from Motorola was the first attempt at a 2-way alphanumeric pager, targeted for e-mail use. To respond to an e-mail, the user must stop what they're doing, find a flat surface, sit down, and then hunt and peck very slowly. The need for a keyboard made the unit substantially larger than it needs to be. Same deficiencies as above. They made room for the keyboard by making the display smaller - just the opposite of what a serious e-mail user needs. This is the first digital phone with its own IP address - It can do voice, page, e-mail, FAX, and even sports a micro-Web browser. Notice how the keyboard both usurps valuable surface area and makes typing nearly impossible all at the same time. The display is the least useful thusfar. Now imagine an LCD graces the entire front surface, while Data Egg-like keys line the outside edges. That would maximize the display size and make the device much more useful. 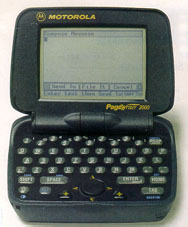 The PalmPilot from 3Com. Great at retrieving wireless information. Miserable at capturing it. 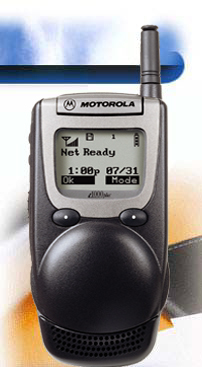 The AccessLink II pager from Glenayre is a complete 2-way alphanumeric pager. Notice lack of a keyboard; messages must be meticulously spelled-out via picking from a menu of letters with the cursor keys - similar to entering your initials at the end of a video game. Neither efficient nor convenient. 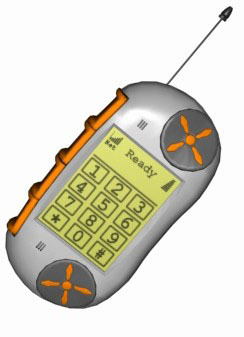 The FriendLink toy from Playmates Electronics. Allows friends to send and receive messages via a 2-way infrared link. Same deficiency as above. Yeah, right... Let's take a bad user interface and make it less portable. Ahhh…That's better. The perfect combination of portability and usability - position independent writing that lets you keep your eyes on the road, or write a letter while on a leisurely walk, enjoying the sunset. 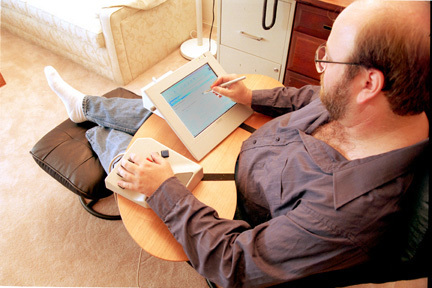 The Data Egg's ability to act as a remote keyboard also lends itself to the Bedridden Workstation, allowing those lying down to have complete access to a standard PC and all the software it runs. The idea was inspired when a fellow programmer had back trouble and wasn't able to use a computer (or earn an income) until he recovered. Realizing that it shouldn't be necessary to have a healthy back in order to use a computer, the environment illustrated below was created. 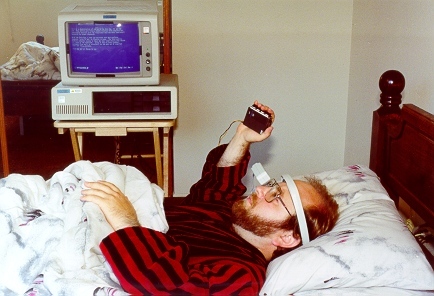 The Bedridden Workstation is created by tethering the Data Egg to a larger computer, and incorporating an innovative display device called the Private Eye for full-screen visual feedback. The Private Eye is a small box which is placed about an inch in front of the user's eye, which projects a virtual image of the PC's screen that "hovers" about five feet in front of the user (but remains invisible to outside observers). This combination of peripherals finally allows the bedridden to have comfortable access to the PC and all of its software. The whole computer mouse paradigm evolved because someone at Xerox decided that kids can learning pointing faster than adults can learn command lines. Have you ever seen a 3-year-old try to use a mouse?? Lack of hand-eye coordination in kids, plus sloppy, unresponsive mouse implementations for adults make the process far more inefficient than need be. The setup pictured above addresses this problem, and is ideal for non-typing-intensive applications like surfing the web, spreadsheets, photoshop, power point, and generally anything other than word processing and e-mail. It works on the principle that it is considerably faster to point directly to an object than to indirectly move a mouse pointer there. Using this setup, mouse-intensive applications like those mentioned above can be operated anywhere from 2-5 times faster than on a conventional workstation. And, since it can be used from a reading chair, it is quite a bit more comfortable to use. 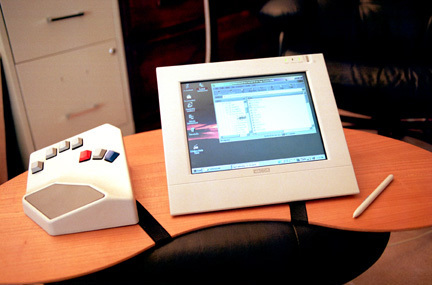 The working prototype pictured is comprised of a combined SVGA display/writing tablet from Wacom, plus a one-handed Data-Egg-like device (in this case a modified InfoGrip BAT with a dedicated microcomputer inside). 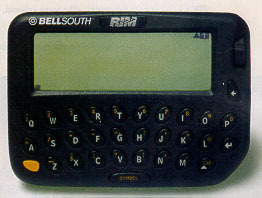 Built-in alphanumeric pager (with automatic cross-referencing of names and numeric pages); respond via built-in keyboard. Packet Radio interface: download and upload e-mail messages in the background; answer messages while waiting in line at the airport. Foreign Language translator; type a sentence in one language; a translation appears on the screen. Complete phone book, including reverse-search phone book file, so you can cross-reference who just paged you. Complete appointment calendar, synchronizable with your PC. Calculator, including foreign currency exchange. Games, + other educational pursuits. Track your hours and activities on-the-fly. Great for lawyers and others who must account for their time and/or generate status reports but are too busy to do so. Automatic Touch tone dialing - type in name (or recall page), hold unit up to phone to dial out via sound. Will even include credit card sequence. Travel alarms w/ reminders. Interval alarms for exercising. Sort ideas on the fly and view by category later. Grocery shopping mode for Egg - Check off items, keep running cost total. Digital audio recorder: have it record sound for musicians who might forget that great musical phrase they just thought of. Camera time exposure control port - program the Egg to take sequential pictures using various over- and under-exposures. Makes for beautiful nighttime shots without the guesswork.